The drug "Badyaga Forte" is an effective way to eliminate bruises, abrasions and other specific skin problems. Anti-inflammatory and local irritant effect. Widely used in medicine and cosmetology. 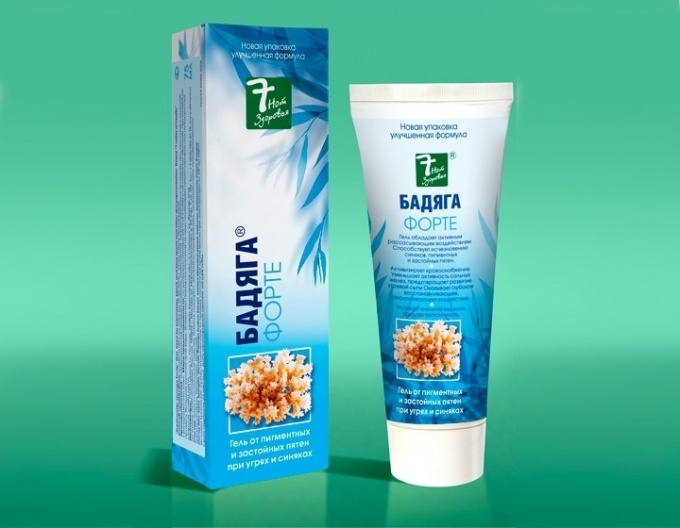 "Badyaga Forte" is used to improve the condition of the skin with bruises, acne and pigmentation. The gel has anti-inflammatory and resolving action, dilates blood vessels and relieves itching. The therapeutic effect of the drug due to the properties of its constituent components, the main of which is the pain. Badyaga - freshwater sponge it is, which lives at the bottom of rivers and lakes. It consists of needles of silicon, they provide mechanical effects on the skin. As a result, increases local circulation, reduces the activity of sebaceous glands. The pores are cleaned, there is resorption of pigment spots and stagnant. This process is accompanied by a temporary redness and tingling of the skin. Intensive absorbing the impact of concoctions is complemented by a soothing and healing effect of extracts of yarrow and plantain. Yarrow extract enhances the process of oxygenation, which helps the regeneration of cells and promotes rejuvenation. Plantain has moisturizing and antibacterial effect, increases the protective properties of the skin and prevents acne. The drug has a pronounced effect of exfoliation and stimulates the production of collagen cells. - to cleanse and rejuvenate the skin. There are a number of contraindications to the use of the drug. You should not use if are allergic to at least one of the components. Before use make test on the inner side of the elbow. To do this, put a small amount of gel within 10 min. to observe the reaction of the body. If no irritation occurs, the product can be used for the face. Not suitable gel for dry sensitive skin prone to irritation. Not recommended "Bodyaga-Forte" pregnant and lactating women and children up to 18 years. The gel should be applied on clean skin in a thin layer gently massage, leave on for 15-20 minutes and rinse with warm water. The procedure can be performed 2-3 times per week depending on the sensitivity of the skin. After treatment advised not to go out in the sun for 2 hours. In place of injury the gel is applied for 30 min. balance must be washed off with water or remove with a damp cloth. Use 2-3 times a day until complete disappearance of the bruise. You should avoid getting the drug on mucous membranes and open wounds.